November’s Stamp & Coin Mart comes with a six-stamp miniature sheet, courtesy of Guernsey Post, ensuring the issue will be hugely popular with collectors. 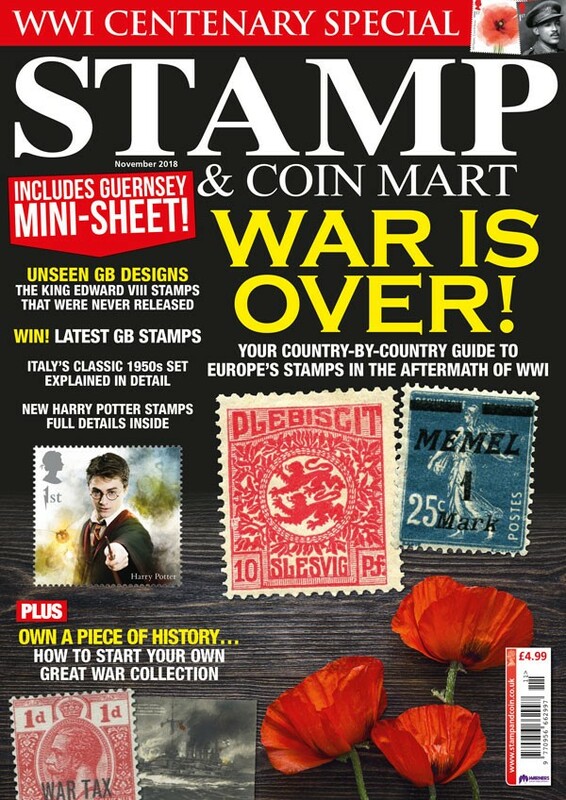 In our WWI Centenary Special we take a look at how the welcome end of the ‘war to end all wars’ dramatically changed Europe’s stamps, while the Forces Postal History Society provide us with a guide to collecting the stamps and postal history of the Great War. We also reveal the latest WWI stamps issued by Royal Mail as the centenary commemorations come to an end. In our regular look at the gems held at The Postal Museum, we recall the short reign of King Edward VIII, which created a surprising amount of material in the form of trials and essays. Our new 'Celebrated Sets’ series continues as we examine Italy’s 1950s ‘Provincial Occupations’ set, while our popular ‘Stamp Stories’ piece tells the tale of the Nicaragua air stamp that almost caused a war. Our postal history pages chart a cover sent from Portsmouth to Norway more than 160 years ago, and our collecting by county guide arrive in Durham, to detail the postal history and ephemera to be found in the region. Meanwhile, our coins section includes guides on how to collect Victorian coins on a budget, and how to identify counter marked Spanish coins.